Awesome Gameroom Includes Pool Table, Foosball, and Air Hockey! Enjoy endless luxury when you stay in C504! With its full game room including foosball, pool table, air hockey, Pac-Man Arcade game, and wet bar, combined with proximity to three local ski resorts and Pineview Reservoir, you will never be bored during your stay in Eden, UT! Basement: One bedroom, one full bathroom, media room, and large game room with wet bar. Bedroom 1: Master suite -1 Queen bed with full ensuite bathroom with jetted tub, glass shower, and double vanity, and kitchenette. Bedroom 4: 3 Bunk beds including 5 twins and 1 full bed, with shared bathroom. Media room: Includes a pull-out sleeper sofa. 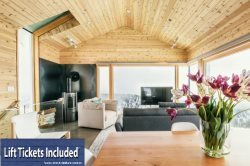 We are truly excited and honored to share our homes with each and every guest and we invite you to stay with us at Powder Mountain Getaways - C504! The community HOA complex is a 3000 sq. ft. Clubhouse that can be reserved for private functions, and it has a small fitness center in the lower level. On site there are enjoyable walking trails that meander throughout our community past streams, ponds, waterfalls, and fairways.